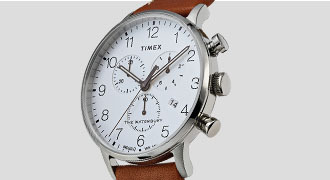 A casual way to wear a classic chronograph, the careful attention to detail allows the Timex Standard to shine as one of our most refined everyday watches. Designed with versatility in mind, this chronograph brings together classic elements with modern materials and easily interchangeable straps. The gray chronograph dial and brown leather strap are complemented by the lightweight gold-tone case and traditional oversized crown — a nod to our original pocket watch. 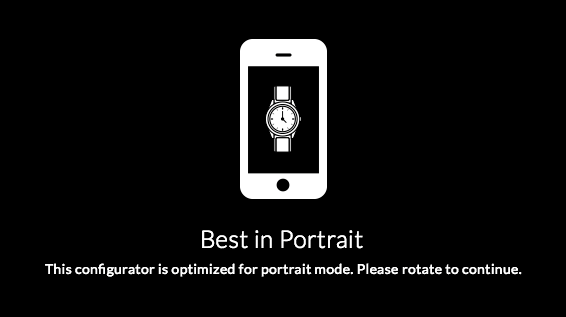 Since 1854, we have only made timepieces we could be proud of. 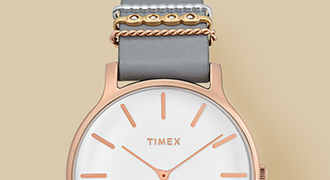 Timex Standard watches are created using American hide or resilient woven fabric and durable metals, then quality-tested for 24 hours before it leaves our watchmaker's hands. Our standard is to exceed your expectations. 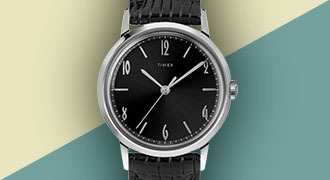 Timex Standard is the watchmaker's casual watch. With a careful attention to detail and taking design cues from the past, we created a collection that is well-suited for everyday wear. 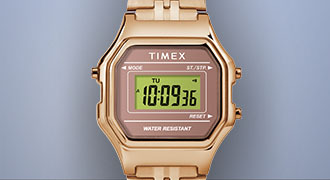 Digging into our archives, we took cues from the past to inform the design of our Timex Standard. The watches of this collection are complemented by the classic oversized crown - a nod to our 1900 pocket watch and our heritage as watchmakers.